The Ala Loa Trail (King’s Trail) south of Waikoloa. 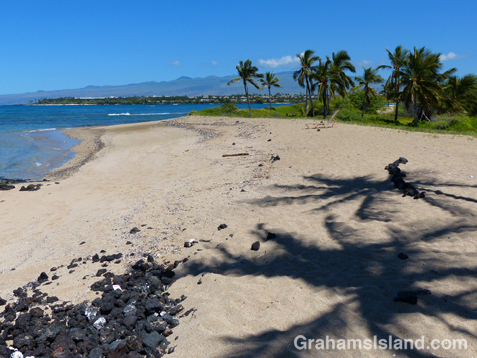 Keawaiki Beach with its lone palm tree and Hualalai volcano in the background. This hike is a 7 mile loop directly north of the Keawaiki to Kiholo loop hike that I posted about here and here. One could combine the two, but it would make for a long, hot walk, though with several opportunities to take a cooling dip. 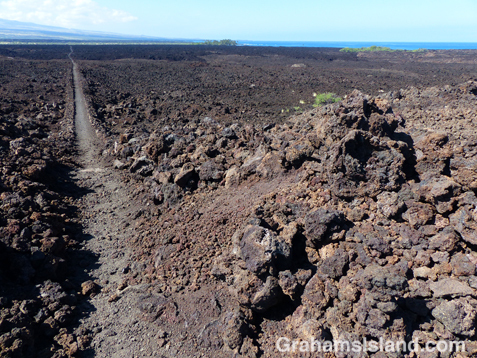 I chose to start the loop at its northern end, heading south on the inland lava field before it got too hot. 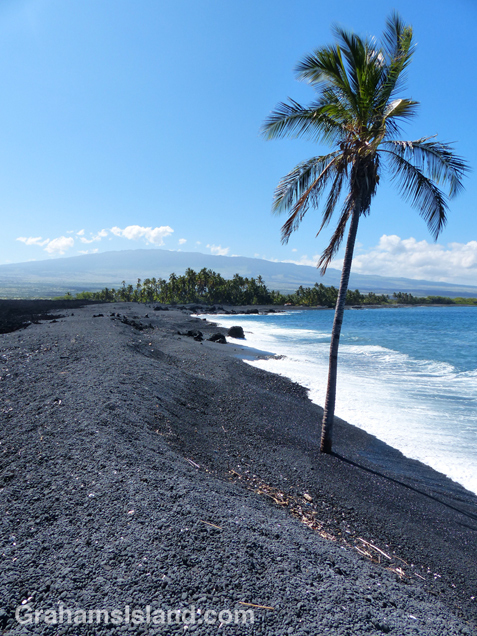 The return, along the coast, is still over lava, but usually features a cooling sea breeze. A Bay is officially known as ʻAnaehoʻomalu Bay, but most people find A Bay easier to pronounce. There’s bathrooms and showers at the beach here so I find it a good place to start and finish. From the parking area, head inland to pick up the old King’s Trail which is marked by a sign, though it’s obvious without it. The King’s Trail heads south in a ramrod straight line. Eventually, this trail intersects with a dirt road headed toward a cluster of palm trees on the coast. Follow this road down to the Brown estate, which is surrounded with barbed-wire. The trail goes down the side of this fence to Keawaiki Bay and its lone palm tree. 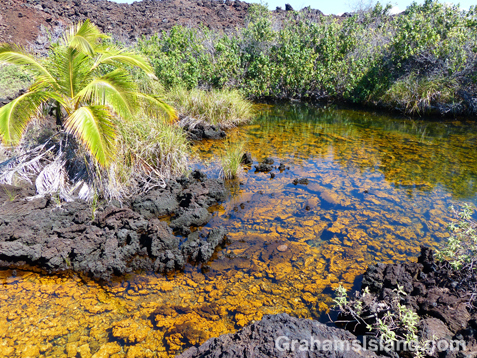 The Golden Pools of Keawaiki (though they’re actually inland of the next beach down the coast). The golden color is due to a unique algae. Heading north again, the next bay is Pueo Bay and a small trail inland from this leads to the Golden Pools of Keawaiki. The color of these pools is due to a unique algae that grows here. There’s no swimming in these pools, but further up the coast, after passing Weliweli Point, another lone palm tree marks Akahu Kaimu Bay. Just inland from the palm is a large freshwater pool which is perfect for a cooling dip. When I visited, there was no one else there, or indeed within a mile of the spot. Heading north along the coast again, the lava transitions to the kind of sandy beaches that Hawaii is renowned for. The southernmost beaches are usually sparsely populated or just plain empty. These beaches lead back to A Bay and its welcome facilities. 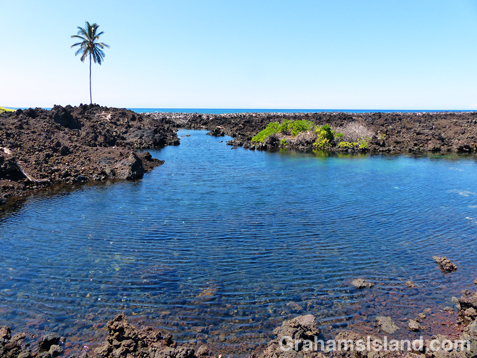 The freshwater pool behind Akahu Kaimu beach, marked by another lone palm tree. After a hot, dry walk, a dip in the pool was very refreshing. A sandy beach straight out of the brochures at the south end of A Bay.